Let’s talk about fish scales. I’m not referring to the ones that line their bodies, but to the ones which you use to record a fish’s weight. Are you someone who likes to fish? If so, it will work greatly to your advantage to carry a fish scale with you. Whether you are someone who fishes casually or simply for the sport of it or someone who competes in tournaments and needs accurate and easy ways to record and remember weights, there is a scale out there that will greatly improve your fishing life. For the most part, they are small, compact, and will easily fit in your pocket or tackle box. You will get a lot of use out of it and get to the point that you woe the day you leave your house without it. There is also the benefit of having proof of your big catch with more than just a picture. It just adds an extra measure of validation to have the scale weighing your fish in the same frame. There is no room for an argument there. Plus, we all know that catches seem to get larger and larger as time goes on and this is an accurate way to truly represent how much your fish weighed when you caught it. If you aren’t convinced quite yet that you need a fish scale in your life, let’s dive into some of the best and most popular models – most of which are very reasonably priced and will not take much if any justification to go out and purchase. This little scale does exactly what it is advertised to do. It is digital and lit by a blue light. It will weigh up to 110 pounds/ 50 kilograms and does so quite accurately. The hook is strong and sturdy so there is no need to be concerned about it breaking. As an added bonus, it even comes with the two AAA batteries it needs to function included. One of the most exciting features on this scale is the ability to zero out. What that means for you is that you can hang a net or bucket on the hook, zero it out, and get the actual weight of your fish without having to do any sort of calculations to account for the weight of your bucket. It also prevents you from having to stab the fish with the hook in order to get an accurate measurement. When you catch a prize fish you don’t just want to know its weight, you also want to know its length! With this scale, you can quickly and easily get both out of the same too. It’ll measure whatever you need in cm/in/ft as long as it is less than 1 meter. This little gem is very inexpensive. It will do everything that the expensive fish scales will, will last you a long time, and barely makes a dent on your pocket book. You definitely get good quality at a low price with this Dr. Meter Scale. This is a small, compact scale that functions very well. While it’s not tournament ready, it’ll certainly get you a reasonably accurate weight for any other purpose up to 110 lbs/50 kg. 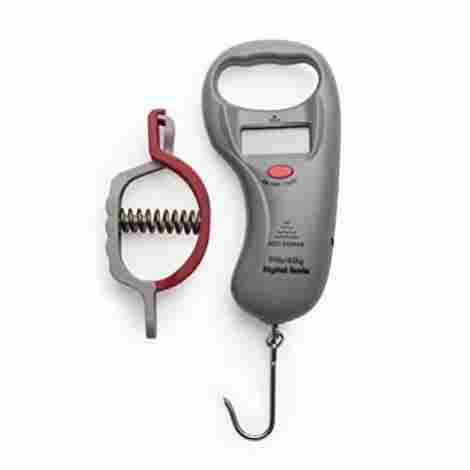 The hook is stainless steel and includes a tare function to help make weighing fish easier. A great function of this scale is that it will automatically shut itself off after 120 seconds if it isn’t actively being used. This is great for you battery life and will make sure you are getting the best longevity possible. This scale includes an overload indication. This is essentially a way for the scale to protect itself from breaking and protect you from having to replace it too early. It lets you know when its over capacity so that you can promptly remove whatever it is you are attempting to weight without getting inaccurate results, or worse, ruining the scale. This little scale offers great bang for it’s buck. It comes with the 2 AAA batteries needed to operate it and barely costs more than the batteries alone would cost if you were to simply go out and buy them. You might as well spend a few more dollars and get a scale to go with them! Great value at a great price here. This handy little scale is multipurpose. You can grip your fish with it - removing the opportunity for your hand to be snagged or injured. It is corrosion resistant and good in both fresh and saltwater. It’s obviously good for weighing your fish, but also provides a ruler to measure it as well. This fish gripper, holder, and scale is built with you in mind. It has a comfortable, non-slip EVA handle with an adjustable wrist strap that will help you hold things better and be less likely to lose it. Even the thumb hold on the gripper is built ergonomically for ultimate comfort and function. For a tool that has so much functionality, it is small and very easy to carry around. It is barely longer than your hand and weighs less than 5 oz. You’ll barely notice it in your pack and it won’t get in the way. This is a little more expensive than others on this list, but it is still very affordable. Considering the fact that it’ll hold up in water - both freshwater and saltwater - it is spending a little more so minimize replacing. If you want something that can both grip and weigh your fish you will be happy you spent a little bit more and went with this scale. This fish scale makes our list for a number of reasons. It is compact, accurate, and easy to read. It is perfect for both tournament usage and bragging rights usage. 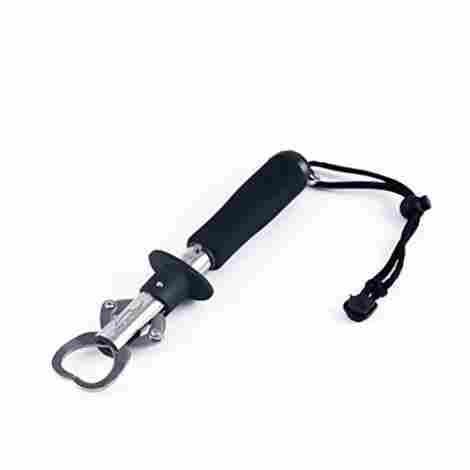 It offers a tare function and comes with a stainless steel grip. It can be used up to 99 lbs/45 kgs. It also includes a lip gripper and tape measure. A big perk of this fish scale is that it comes equipped with a gentle fish lip gripper. This protects the fish and prevents you from injuring it in order to get a weight. It also works in your favor as you don’t have to grip the fish with your hands. You can use this scale for all of your fishing needs. Do you like to fish in saltwater and routinely catch salmon? Or is fly fishing more your style which results in your catches looking more like trout? Maybe you like to kayak? Good news for all of you - this scale will live up to all of your expectations. This is the most expensive one on the list so far, however; that doesn’t make it very expensive all things considered. You get a lot out of this little guy - you can weigh and measure your fish and not worry about it getting ruined on your kayak. It also works for tournaments - which is helpful. Overall, it’s worth its cost. 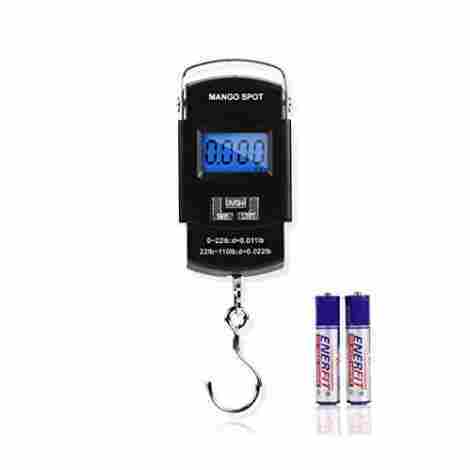 This is a compact and well lit digital fish scale. It measures accurately down to 5 or 10 grams, but also has an option for ounces. It is capable of measuring up to 110 lb/50 kgs. It also features a tare function and includes a tape measure. This fish scale has a large screen that offers easing reading and a blue LCD backlight. It is backlit and makes it easy to see in darker conditions. This will come in handy for early morning or late evening fishing excursions. Do you like to measure in different units for different occasions? Or perhaps there are times that you catch small fish and need an accurate weight? No worries - this scale has you covered. It can measure in ounces, jin, kg, and pounds. This will satisfy all your weighing needs and will even make this scale functional outside of the fishing realm. 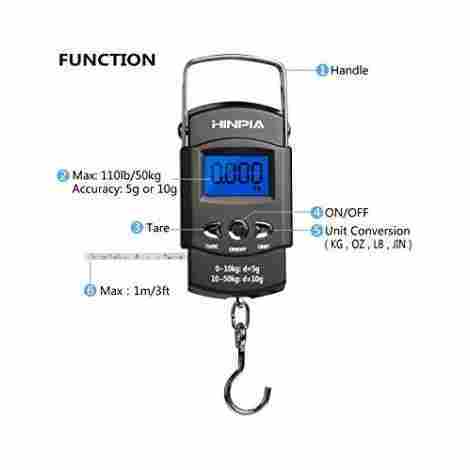 The Hipnia Digital Fishing Scale comes at a very reasonable price. The scale itself is low end as far as price goes, but it doesn’t come with batteries like others in the same price point do - making that an added expense. Still, all things considered, it’s not too much even if you add in the price of batteries. You’ll still be getting your money’s worth here. This stainless steel fish scale is no frills and all function. 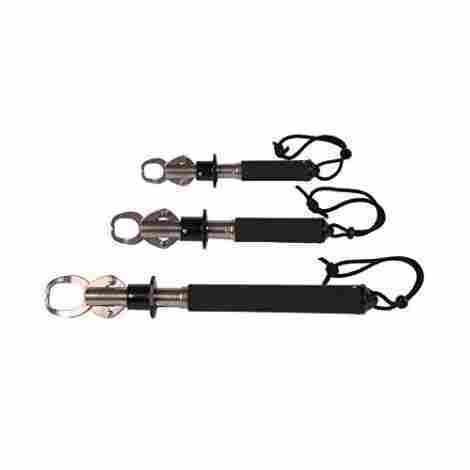 It is corrosion resistant and offers a comfortable handle with attached lanyard. 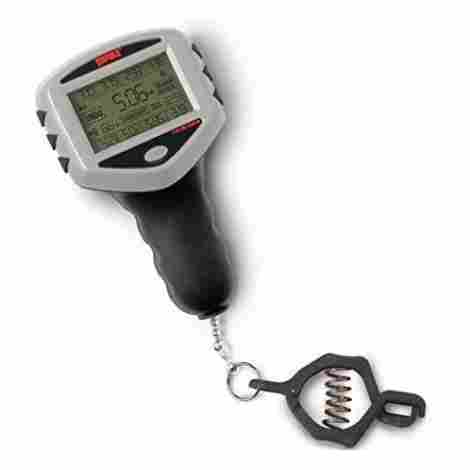 It is easy to use and will quickly, accurately, and successfully weigh all fish you catch up to 40 lb/15 kg. You will get a lot of use out of this fish scale. It is capable of surviving harsh heat and cold. It is easily and successfully used in both salt and freshwater. It is corrosion resistant and because it’s not digital, won’t quit working when it gets wet because it’s only just a matter of time before your fish scale gets wet. Since you’ll largely being weighing fish while holding your scale, you’ll need the handle to be non slip in order to avoid tragically dropping it and risk losing both your scale and prize fish. This one comes equipped with a non-slip EVA handle that offers an adjustable wrist strap for added comfort and protection. This scale offers a lot of bang for its buck. It is marginally more expensive than the cheapest ones on this list, but is a lot more durable than they are. It can get wet and withstand harsh conditions - both hot and cold - without being ruined. It’ll last a long time and satisfy your weighing needs while also offering a good gripper. This fish scale is among the fancier ones - with a price to reflect that. It is easy to use one handed and will grip your fish like a dream. The scale can go up to 60 lbs depending on the exact size you end up buying. It is stainless steel and can be used in saltwater with no issues. Very often, the fish you just caught and want to weigh doesn’t want to hold still. This fish scale accounts for that by rotating and spinning with your fish. It goes all 360 degrees and will keep spinning as long as your fish does. The gripper causes minimal trauma to the fish. You can successfully pick it up, much easier than you can by hand, and weigh, keep, or release without harming the fish. There are no messy hooks and no piercing involved. This is hands down the most expensive fish scale on our list. However; it has the reviews and the functionality to consistently sell and impress buyers at that price. You’ll be spending big bucks here, but if you’re a big time fisher it will make your life a lot easier and you will appreciate its functionality. This fish scale is nice and compact. It offers an easy to read digital screen with a blue backlight. 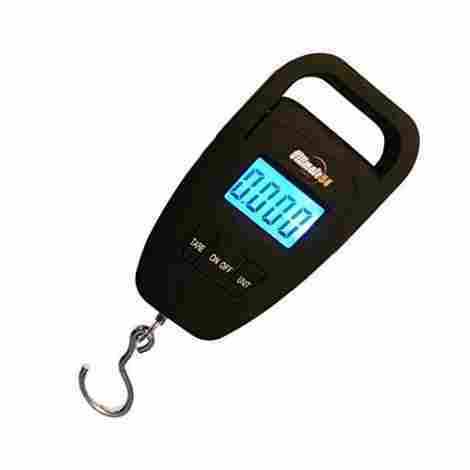 It will weigh up to 88 lb/40 kg and will very accurately measure your fish - or whatever you want to weigh with it. It has a plastic shell and rust resistant metal. As far as the scales on this list go, this one is easily the most precise. It will measure down to 0.01 lb or 0.005 kg. It will display in grams, kilograms, ounces or pounds. In addition it will do pounds plus ounces - for example, 4 lbs 6 oz. This fish scale will automatically lock one the weight stabilizes. This is a nice feature that will get you accurate weights even if your fish starts to move around again. It locks quickly, which is very helpful for wiggly fish. However; that may also be a problem if you don’t want it to lock right away. This is a very inexpensive fish scale and ranks among the cheapest on this list. It will serve you well and is absolutely worth the money you’d be spending on it. The Ultimate54 Portable fish scale is a very functional little scale. It will weigh accurately from as little as one pound all the way up to 110 pounds. It measures in pounds, ounces, kilograms, and jin. It has an auto-off function, zeros easily, and will data lock. As a bonus, it comes with a luggage strap so that you can make it multipurpose if you so choose. This fish scale comes at a relatively small price point but functions as well as one that cost much more. It is reliable and will serve you well for a long time. Often times people will buy a product simply because of who is selling it. This is one of those cases. You get a 30 day money back guarantee - something relatively unheard of on a product that costs almost as much as the shipping does. The company is very responsive and if you happen to get a defective product, they will promptly replace it with a functional one. As mentioned earlier, this scale is fairly inexpensive considering its capabilities. It is a sturdy, reliable, scale that can work in a whole slew of circumstances. It’s middle of the line as far as price goes compared to others on this list. This fish scale combines a lot of the best elements of the other scales on this list into one. It is digital, but also water resistant. 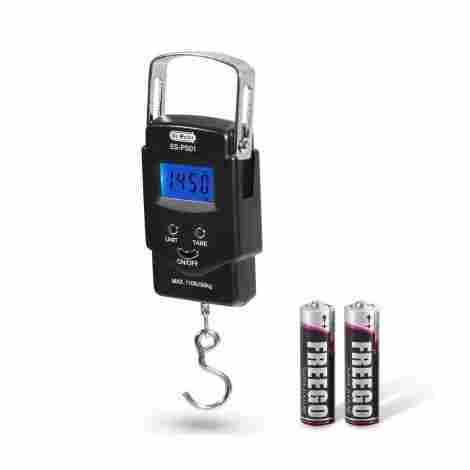 It has three weight display options and comes with the option of a hook or a clamp. We live in a digital world that has touchscreen everything. Why not have a touchscreen on your fish scale as well? It makes things easier to control and combined with the water resistance of this scale, will last a long time. It gives you the ability to store 8 different weights and track weight totals. Not only does this scale offer a touchscreen, it also has the ability to store previous weights and will maintain that data even if battery power is lost. There is no need to worry about losing important weights with this scale because it will remember them even if you forget. Considering all that you are getting with this fish scale, you will be paying more. It is worth the investment though and you will be happy you splurged. You’ll get the water resistance of a mechanical scale, the ease of reading you get with a digital scale, and all the convenience of a touchscreen and memory. This does rank second on our list as far as price goes, but it is well worth the splurge. You are surely convinced by this point that purchasing a fish scale will seriously up your fishing game. It will become a staple in your tackle box and you won’t want to head out on any fishing excursion without it. It’s convenient and very handy to get a quick, easy weight on any fish you catch and what better way to do that by carrying your own scale? But, to carry your own scale you first need to purchase one. What are the things that you need to look for when doing so? There are several things to take into consideration before making your purchase and we’ll dive into them a little bit below. The very first thing that you want to take into consideration when you are looking to buy a fish scale is whether you want a digital or a mechanical scale. There are many good options ranging from cheap to very expensive in both camps, some of which are listed in our top 10. The advantages of a digital scale are numerous. First off, they are much easier to read. You grip your fish our put in in the net on the hook and BAM weight. It’s quick and easy and there is no guesswork involved. Another advantage of a digital scale is that some of them have a memory as well. This will greatly work in your favor because sometimes our memories aren’t perfect and this gives you the option to store and recall if needed. You can even get quite fancy and get one that is touch screen and can add weights together as you go as well as recall past weights. If you do tournament fishing, this is absolutely something you should consider. Obviously, there are downfalls to digital scales as well. While some are water resistant, others – usually the cheapest options – are not and may get ruined with very little exposure to water. This is a big downfall and surely something you need to take into account. There is also the battery factor. It would be pretty tragic if your batteries died mid fishing trip and you weren’t able to record any of the weights of the fish you caught. You can always bring a spare set of batteries to help minimize this situation, but alas, it’s still something to be cognizant of. We just talked a lot about why a digital scale is a great thing so why would you even want to consider a mechanical one? There are actually a lot of reasons here too. First off, it won’t get ruined when it gets wet. In fact, you can get yourself a hook and hang it off the side of your boat if you want. It won’t be phased sitting in the water all day – be that water fresh or salty. Big perk. Most mechanical scales also come with tape measures of some sort and also include grippers rather than a hook, if that is more your style. The downfalls of a mechanical scale are also important to consider. You can’t store or recall any weights. It is a little more complicated to read through and may have you straining your eyes a lot more. The weight limit is usually more limited on a mechanical scale vs. a digital one. Both options are good, valid options it’s just a matter of what works best for your specific set of circumstances. Do you want a gripper or a hook on your scale? Like all things, there are pros and cons to either side. A gripper is super helpful and will come in handy for far more than just weighing your fish. It will help you hold the fish far better than your fingers can and grippers tend to cause far less trauma to the fish. If you are planning to catch and release a gripper instead of a hook is almost a no-brainer. The downsides of a gripper are that they can be a little complicated to work. They may be hard to open or work with one hand. Grippers will also limit your ability to weigh more beyond fish, limiting your scales use to fishing only. So what will a hook do for you good or bad? Let’s start with some of the good. You can hang things on your hook to put the fish in. Netting, or even luggage straps, making it multifunctional. 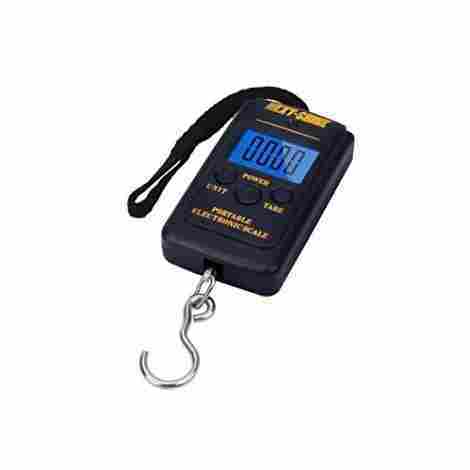 Almost every single scale that comes with a hook, and for sure all of the ones on this list, also comes with a tare function so that the weight of whatever it is that you are attempting to weigh your fish it won’t interfere with the actual weight of the fish. The downsides of a hook include the trauma it causes to the fish – many times causing damage that the fish will never recover from, hooks are more prone to breaking, and they often run small which makes them useless or complicated to use. How serious of a fisherman (or woman) are you? Do you or whomever you are buying a fish scale for competing in tournaments? Or do you simply like to get out the lake for a good time relaxing and unwinding? There’s nothing quite like fishing to help you get re-centered. While most fish scales that are used in tournaments can also be used for recreational use, the same is not true in reverse. If you are looking for a fish scale to use in a tournament, you are absolutely going to want something that gives a reliable, accurate weight every single time. You don’t want a lot of variabilities and don’t want to have to wonder if the weight is accurate. What this means is that you’re likely going to end up spending more money on a scale than you otherwise would. However; there is a good chance that spending more money is a non-issue if you are participating in tournaments. Something that is also helpful for tournament use is the ability to store and recall previous weights. 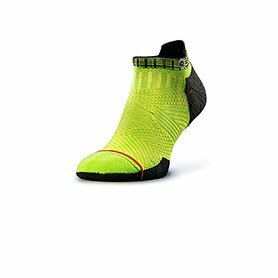 There are also fish scales that will allow you to keep a running weight total which can be a very helpful tool. All of those characteristics are helpful and neat, but do you need something that fancy if you fish largely for recreation? Probably not and you can absolutely find less expensive, less fancy options out there and on this list. There are many products that will simply produce a quick weight that you can write down or take a picture of for storage purposes and be done with it. They may be a little less accurate, but that’s not necessarily as big of a deal if there is nothing but bragging rights on the line. Is there the possibility that it will get wet? This is a big one, and maybe a seemingly obvious consideration, but will ultimately weigh in on what you decide to go with. Very often fishing involves going out on a lake or in a kayak and very much guarantees that your scale will get wet one way or another. This is an important thing to be aware of. Many scales, indeed some on this list, are easily ruined to never work again if they get the slightest bit wet. That’s a big buzz kill if you are out and hoping to use your scale all day/weekend/trip. If there is any possibility that your scale will get wet, you will be well served to spend a little bit more money and get a solid, functional, mechanical scale where this is a non-issue. If you are wholly committed to a digital scale, you’ll have to spend considerably more to get a water resistant scale but ultimately will be glad that you did because it will last you a lot longer and won’t need to be replaced regularly. However; if your intention is to largely stay on land and fish from there, you have many more options. Even the cheapest digital scales will serve you well if you can guarantee that it stays dry. Those same scales are often times multipurpose and will give you more useful than just fishing if you so choose. A: It varies from scale to scale so be sure to check for scale specific specifications. However; scales can have weight limits as low as 15 pounds all the way up to 100 pounds. Q: How do you use this scale with a hook to weigh fish? A: You can either hook the fish directly, which is ill-advised as fish have a hard time recovering from that, or put a net on your hook, zero it out, then put your fish in the net to get an accurate read. Q: How do you use this scale with a gripper to weigh fish? A: You will grip the fish at the mouth/lips with the gripper instead of your hands and weigh from there. Be sure to get one that is appropriate for the type of fish you are fishing to minimize injury to the fish. Q: Does this scale accurately weigh small fish? A: Some do, some do not. Make sure to read the specifications to be sure. Q: Is this mechanical scale waterproof? A: Yes, most are also corrosion resistant and function well in fresh and saltwater. Q: Is this digital scale waterproof? A: Cheaper digital scales are not waterproof and ruin quite easily. However; more expensive digital scales are usually water resistant and will hold up much better. Q: Does the gripper hold up in saltwater? A: Yes. Best practice is to rinse it off in freshwater when you are done to help it last longer. Q: Does the hook/gripper spin or rotate with the fish? A: Most hooks do not. Typically less expensive grippers do not. The more you spend, the better the product and the more expensive versions do spin and rotate with the fish.